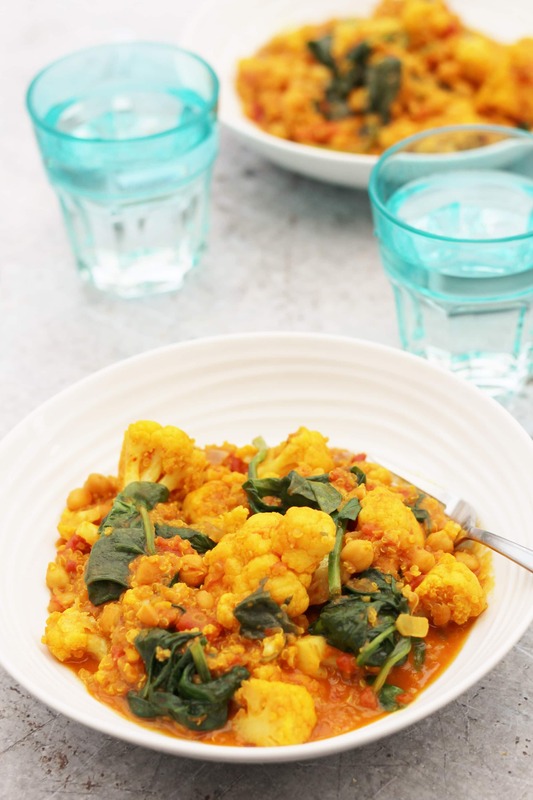 A delicious, easy and quick meal, this one pot vegan Spinach, Cauliflower, Quinoa and Chickpea Curry is perfect for when time is tight but you still want to eat healthily. Hands up who is feeling like they have overdone it a little over Easter…Me, me, me! I am usually pretty careful with what I eat, but lately it has just been an onslaught of chocolate (mainly egg shape) and rich (AKA calorie laden) meals. I am sure Easter is becoming more and more like a mini Christmas every year! I am feeling the need to redress the balance and have some healthier meals now that Easter is over. 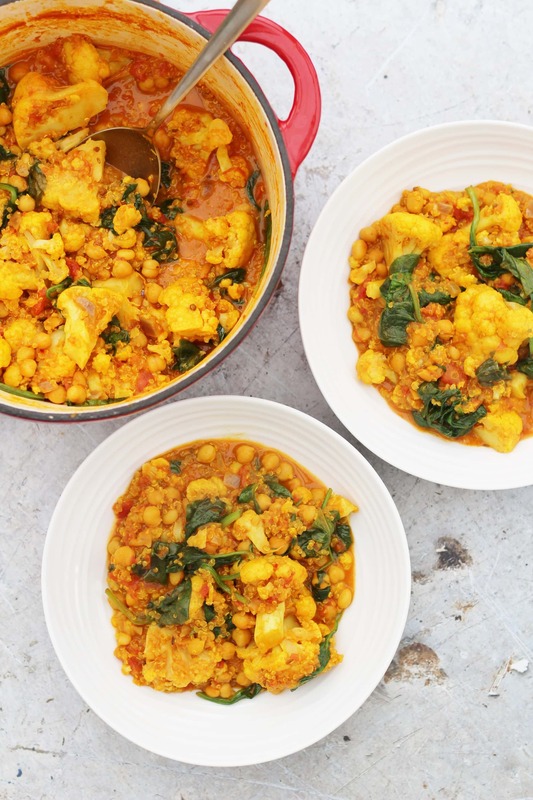 This simple one pot curry is perfect as it is packed full of healthy veggies, spices and quinoa, but still flavoursome and delicious…and surprisingly filling! It also takes less than 30 minutes to make and all cooks in one pot – perfect for when life is super busy. As an added bonus, it is vegetarian and vegan friendly, as well as being gluten free and dairy free. If you are not vegetarian or vegan and want to make this meaty, it would be a great way to use up leftovers…especially leftover roast lamb, if you have any left. The incredible flavours in this recipe are just made to go with lamb, but it would also go well with leftover turkey or chicken. I find a portion of this super filling, and consequently I don’t really feel the need for any accompaniments, but if you feel you need more carbs in your life, you could serve this with naan breads or chapattis. If you’re trying to be healthy, you might just want to have this with a glass of water, right? 😉 But if you would like a wine match, I suggest an aromatic white, such as Sauvignon blanc, Riesling or Gewürztraminer would work well here. Put the olive oil and diced onion in a wide, deep saucepan and fry gently with the lid on for 3 minutes. Remove the lid and add the chilli, cumin, coriander, garlic, ginger and turmeric. Fry gently for 2 minutes – add a splash of water if it gets a little dry. Add the cauliflower, quinoa, chickpeas, tomatoes and coconut milk. Bring to the boil, then reduce the heat and cook for 20 minutes, or until the cauliflower is tender and the sauce reduced nicely. Stir through the spinach until just wilted, and serve the curry in bowls, just as it is or with naan breads / chapattis / pickles / chutneys / etc., if you wish. I am linking this up to Brilliant Blog Posts, Cook Blog Share, Recipe of the Week, Free From Fridays and Cook Once Eat Twice. This curry looks delicious and is just the type of dish I want to be eating after Easter. Full of flavour! You have even made curry look good which is not always very easy. 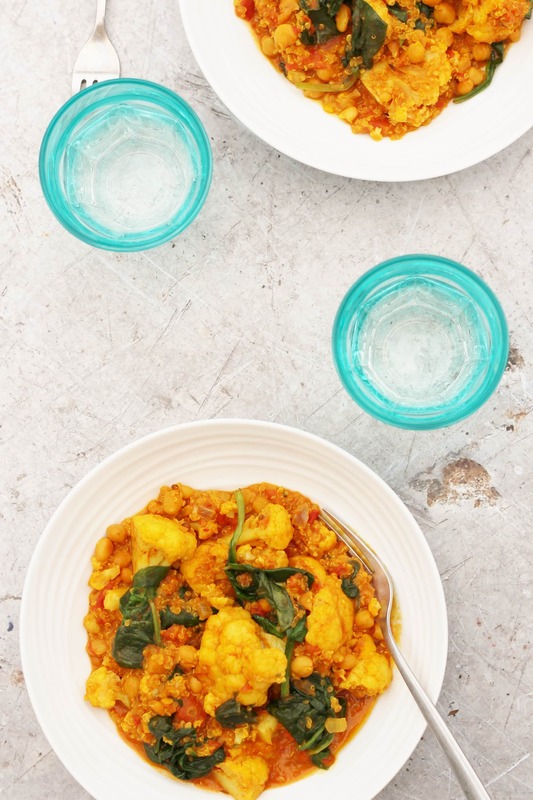 As you know I am a huge cauliflower fan and I love the sound of this recipe. I make something similar but I haven’t tried it with quinoa. Sounds like a good way to add some extra protein to a veggie meal so I will have to give it a go. 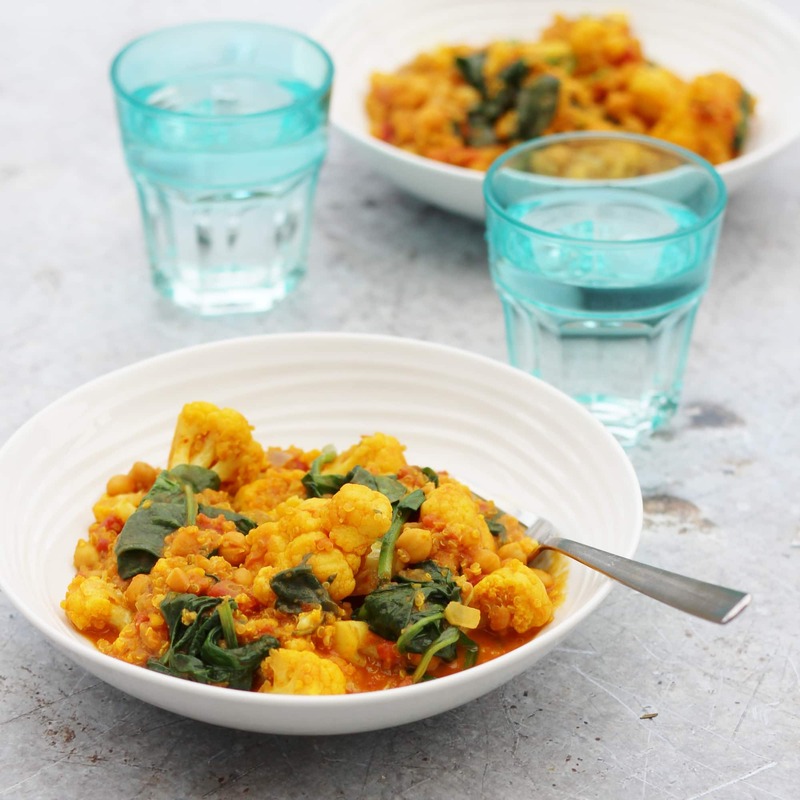 What a lovely fresh curry Eb and yes….. perfect after all that chocolate! Hey, I was wondering if you cook the quinoa beforehand or do you just throw it in when it is still hard? Delicious meal and so easy all in one pot. I had some diced butternut squash left over and added this at the same time as the cauliflower and chickpeas. Unfortunately forgot to take a photo before devouring it! Excellent dish! I left out the chile flakes and spinach (had none), but it was still yummy. The cauliflower gave it great texture.